Discussion in 'General Knife Discussion' started by Klutz, Jul 20, 2018. Nope, this has been asked a couple of times now. The long and short is that Mr Ritter wants to wait to see how well these sell. If they sell well then he may consider producing a smaller version. But as of now he only plans on having these produced. Is it numbered or not-numbered? Curious if only the numbered versions shipped out, or both numbered and non numbered shipped out as well. I'm curious as well as I prefer to not have a numbered version. If'n you have to put numbers, why can't most manufactures put the numbers in tiny print & as close to the scales as possible? Having the text span almost the whole blade? Reminds me of "I'M MR. MEESEEKS! LOOK AT ME!" If numbering is similar to that on the original RSK Griptilians (See Below), it should not be overwhelming. So that makes four for four instances of these blades not being centered. 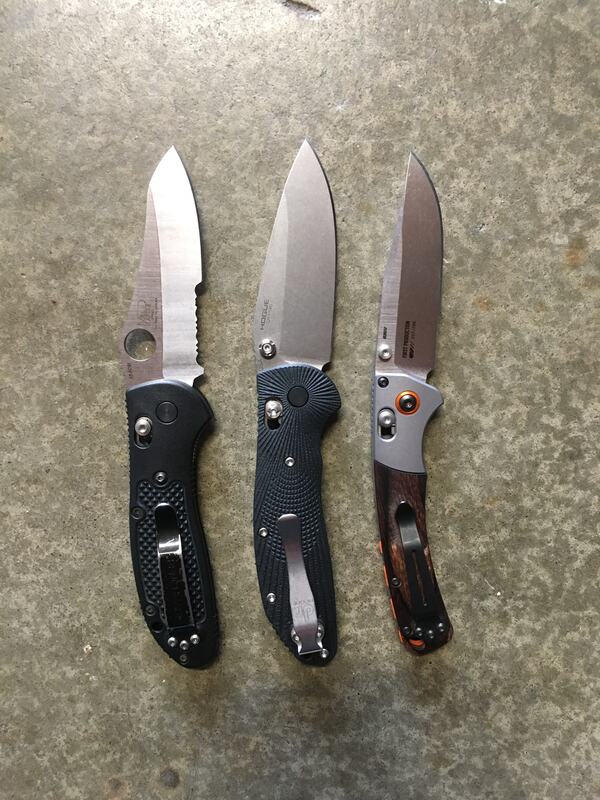 1 from luvthemknives, 1 from Sliceydicey here, one from a fellow member posted previously in the thread, and then a final one from a knife_swap sale series of pics. We however, have yet to see if this centering problem is able to be fixed by the individual or if it is a tolerance issue. But that's a bit disappointing. That said, the issue with centering is the ONLY issue I have seen brought up so far. So there's that to consider as well. Well, three instances. Slicey Dicey got his knife from luvthemknives. Still, it's something I'll look for when mine arrives. I'm another hoping for a mini version. Could you explain where the number is situated on the blade, or perhaps post a photo? right under the hogue name mine is G2FP038 ?? maybe gen2,first prod.,#38 ?? (if I'm holding the knife in my right hand open pointing forward its on the right side of the blade-is this the reverse side?? I believe you’re correct on number placement. A review of Slicey Dicey’s Video shows his knife as “G2FP037” in the same location as you described. (See below). And, KnifeWorks displayed knife on their website appears to be G2FP003. Yes. Smooth and well made. Textured G10 scales, only $13 more than a 552. Beefier blade? Can you elaborate please? Mine should be here today or tomorrow. Looking forward to getting it even though it was kind of surprise. I ordered it before there was even pictures or a manufacturer known. Oh well, a good mistake. 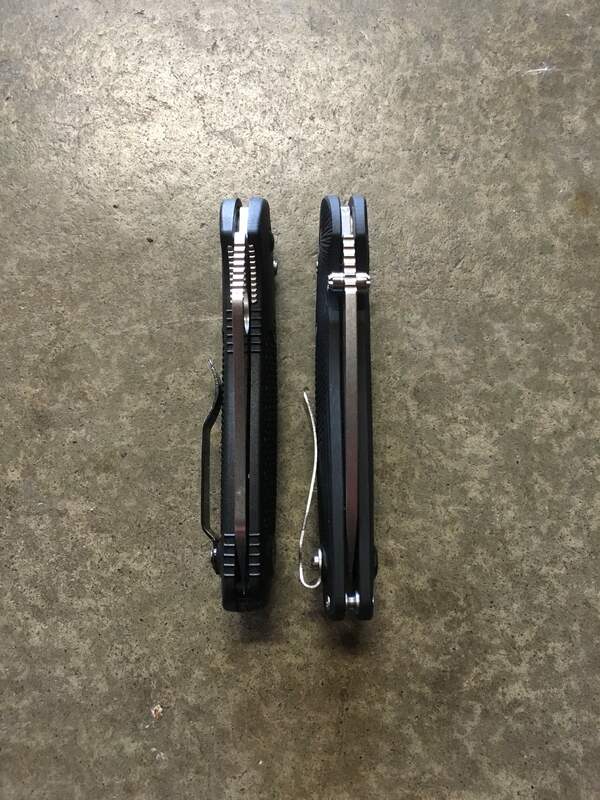 Just got mine and compared it to my 10yr old BM 550. To be honest, both feel very similar in hand. But if I were to nit pick, the hogue has a slightly better feeling but I think that’s because the g10 and extra weight gives it that “better built” feeling. The knife was perfectly centered but had very slight side to side blade play. The blade dropped freely as soon as I disengaged the lock so maybe I could adjust the pivot to improve the blade play without sacrificing the action too much. I’ll try to upload some pics when I get the chance for those who are interested. I figured I would just post some comparison pics since there are several pictures/videos of the knife itself floating around. BTW...that is the mini crooked river on the right but I’m sure most of y’all knew that. Gary W. Graley, Tommy-Chi, Cscotttsss and 7 others like this. grownstar and palonej like this. Now I want a double cheeseburger. As of 2 days ago, they told me they had around 350 Pre-orders, and were gettig in a batch of 93 that day. Mine would probably be shipping in about a month, going on the order the Pre-orders came in.